The psoas (the deepest skeletal muscle in your body, originating at the very last vertebra of your thoracic spine and attaching at the top of your inner thigh) often contracts when we feel afraid or anxious, playing an intricate role in activating the body's fight or flight response. In turn, by consciously releasing this muscle, we can soothe our system and activate the “rest and digest” response. Join Nancy Adler for this all levels 25-minute class and learn tools you can use on the mat to release your psoas. This practice includes breath work, core work, lizard pose, a classic sun salutation, a variation of supported bridge, and more! 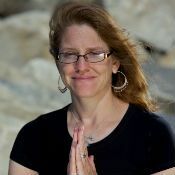 Visit Flyingyogini.com to learn more about Nancy.